The musical is a series of 19 politically outspoken, darkly comic, and sexually charged musical monologues that explore the negative aspects of African-American street life and the ghetto experience. Each character has a painful story to tell in funk, soul, jazz and blues-inflected songs. The innovative piece, presented in a confrontational, "in your face" style, is a precursor to choreopoem, spoken word, and rap music. It "contributed to the growing black presence on Broadway." Une forme totalement unique, "Ain't Supposed To Die A Natural Death" est une narration courageuse et vigoureuse de la vie des Blacks de la rue et qui explore chaque aspect de la vie des ghettos, peuplée de drogués, de prostituées, de souteneurs, de lesbiennes, de drag queen, de mendiants aveugles, de lieutenants de Malcolm X, d'ouvriers d'ateliers clandestins, de flics tordus, de prisonniers, d'amants et de rêveurs. La plupart des personnages n'ont pas de nom. Le premier acte décrit une journée "normale" dans le ghetto alors que le second acte se déroule durant une journée "violente", durant lequel on assiste à un pillage et à des meurtres. "Ain't Supposed To Die A Natural Death" était un coup énorme sur Broadway dans son commencement original courir pour 325 performances et amasser sept Tony nominations, y compris plus Bonne Comédie musicale. 1 Ain't Supposed To Die A Natural Death peut-être considéré comme un musical ethnique. L'ethnie abordée est: Blacks américains. In 1970, Van Peebles decided to transform some of the albums he had recorded between 1968 and 1970 into a musical. According to Van Peebles, "The songs were mirroring the incidents that were happening in the streets." Van Peebles marketed the musical to black audiences in churches "all up and down the fu**ing East Coast. Ministers have congregations, and the congregations would come with busloads of people." The piece was first produced by Black Arts/West at Sacramento State College in Sacramento, California in 1970. After ten previews, the Off-Broadway production, directed by Gilbert Moses, opened on October 20, 1971 at the Ethel Barrymore Theatre, then transferred to the Ambassador, for a total run of 325 performances. The cast included Bill Duke, Albert Hall, Garrett Morris and Beatrice Winde. Phylicia Rashad joined the cast in 1972. 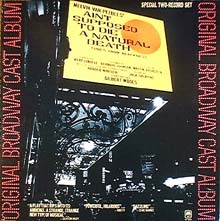 An original cast recording was released by A&M Records. In 2004, Classical Theatre of Harlem staged a revival directed by Alfred Preisser, choreographed by Bruce Heath, and featuring Ralph Carter. In 2006, it was presented as theatre in the round in T New York, a small Manhattan cabaret, on weekends only. Aucun dossier informatif complémentaire concernant Ain't Supposed To Die A Natural Death.